It is said that there is always a woman behind every successful man. 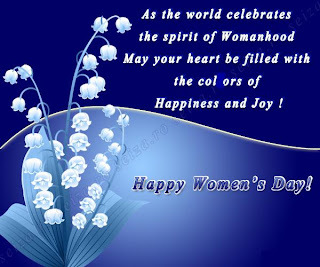 In order to honor women around the globe, Women’s Day is celebrated world wide to appreciate their efforts. 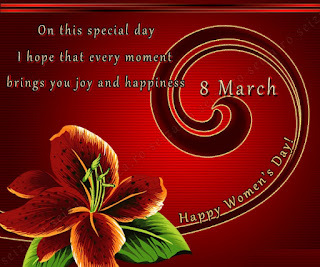 Like every year this year also, Women’s Day will be celebrated on 8th of March. The United Nations have declared a theme “Empower Women – End Hunger and Poverty” for International Women’s Day 2012. The theme can be different in every country. In many countries, International Women's Day is an occasion to honor and praise women for their accomplishments. This year the inspiring women will be cheered up by sending a free international Women’s Day e - Card. The women, who have made efforts that will bring some positive changes in the fight against hunger and poverty, will also be honored. Such women will be awarded with a special award. Different days like Fathers Day, Mother’s Day, Women’s Day are celebrated in order to appreciate and honor the role of that particular person in the society. Women’s day was initially called International Working Women’s Day celebrated every year on 8th of March. The celebrations range from showing appreciation and respect towards women’s social, economic and political achievements. The real tribute to the woman around us can be paid by assigning her a place of dignity in the society, providing equal rights like men and recognition of her achievements in her life. This will be the best way to cheer up the encouraging women and celebrate coming Woman’s day. Another new trend which has become common is gifting the lady near and dear to you like your mother, sister, grandmother or fiancée with exclusive gifts. The first national Women's Day was observed on 28 February 1909 in the United States. To mark the economic, political and social achievements of women, lots of events are hosted on this day as well as throughout March. This day is celebrated in different manners worldwide. In some of the countries like Cameroon, Romania and Bulgaria it is customary to give flowers and small gifts to the women. In Italy men give yellow mimosa flowers to women. Whereas these flowers and chocolates are also the most common Mother’s day presents in Russia and Albania. In countries like Portugal, groups of women usually celebrate woman’s day by arranging only ladies dinners and parties on the night of 8th March. In India we look at woman as the symbol of strength. Her courage, natural compassion, attitude of fighting the odd situations in life all must be praised. Coming Women’s Day choose your absolute woman from a list, representing above qualities and give her a gift of lifetime. You might be wondering about that gift, which can be remembered for the rest of her life. It will prove to be a special gift and a salute to the Absolute woman on the Woman’s Day. Celebrate coming Women’s Day by gifting a vacation package called Magic Holidays, offering vacations for a period of twenty five years on one time inflation free payment. Happy Women's Day from Panoramic Group's timeshare product Magic Holidays!! !